Evernote is a free online app that you can download onto your phone, tablet, and is also accessible through your computer. It allows people to write ideas, articles, take pictures, post reminders, and turn them into point form in the app. For me, this app has replaced the pen and paper. There is also a premium version that allows for more advanced features. It automatically syncs everything up so typing an idea or article in one device will allow easy access in another device. Another advantage of this app is the way it allows me to organize the notes. I can create tags or notebook so all my notes are organized into one subject. I use this app as a sort of brain dump for me. If I have an idea or if I am taking notes in volunteer meetings, I would take out my phone and start using Evernote. Sometimes that stroke of genius idea comes and goes, if I don't write it down in time, I know I will lose it. This is one area even I need to consciously do. To me, putting things in its proper place means leaving your keys, wallet, and other important items in a place you remember to go back to. I have lost a lot of my time in the mornings searching for keys or my cell phone. Be smart by designating a specific area for putting your personal items in so when you are about to leave the house you know right away where to go to pick it up. If your home is messy then maybe it is time to clean it up and start organizing the papers and items lying around. Doing this may help you find something that you had thought lost. It may be time consuming to clean and organize but you save yourself a lot of grief when you are not scrambling in the mornings. Robert Pozen is the ultimate productivity guru, a well trained man in the art of being smart and efficient. He was an instructor at the Harvard Business School and a full-time chairman of a global financial services firm. A writer of four books and hundreds of articles. In between all this, he had time to raise a family of four. This goes to show how productive he is in his personal and professional working life. Some of the ideas in his book may seem like common knowledge such as creating clear, concise goals, and then priortizing them based on importance. But what he does differently is his execution. Using his calendar as an example, Robert Pozen uses a two column calendar. He would schedule his meetings and tasks on the left, and in the right column, he jots down his goals for each task. Doing this allows him to be laser focused in getting things done. As for being efficient in all aspects of his life. In the morning, he advises people to find ways to use as little brain power as possible, for example preparing what you will wear to work in the night before. The key is to try and keep your life as routine and simple as possible, because through time, people will become more efficient through repetitive tasks. 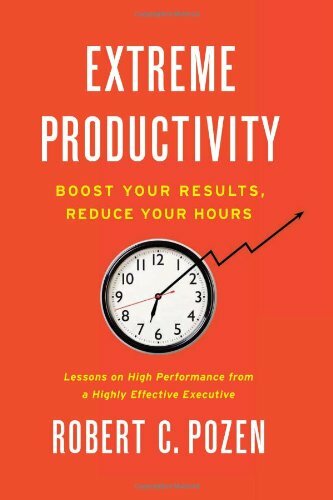 Robert Pozen also spends a large section of his book on being efficient at work, particularly in the areas of reading, writing, and speaking effectively. I own this book myself and I would go back to it now and then. This is a definite recommendation. Truth be told, sleeping for eight hours doesn't necessarily mean you are getting enough sleep. Everyone's ideal hours of sleep varies. What is important is to get quality and efficient sleep. So how do you make sure you get the best sleep possible? Don't drink coffee after 1pm. The half life of a caffeine is about 5.7 hours. That means that even after 10 hours, there is still some caffeine in the body. Another method to ensure good sleep is to sleep in a dark and quiet room. The darkness helps fool the body into making you more sleepy. If you are someone who reads a book or looks at your smartphone before you go to bed, try wearing orange sunglasses. The reason is a lot of these devices emit a blue light that disrupts sleep patterns. I never tried orange sunglasses myself but I have heard from podcasts and people who swear by the orange sunglasses. So, it may be worth a try. The Wunderlist app is my go to app to creating lists and checking items off. The Evernote app also has the ability to create and maintain lists. But I still prefer Wunderlist because it has a much cleaner user interface and the entire app is solely designed for creating lists. Similar to the Evernote, this is an app I use on my phone that also syncs with the computer. Where Evernote is my data dump for ideas and note taking, Wunderlist is where I maintain my grocery list, tasks, and even my goals. The biggest help I get from this app is the sharing of lists with others. This app allows others to share lists with you so you can make edits to the lists. Imagine having a grocery list and saving the hassle of calling your family for what to buy and writing it down on a physical piece of paper. Multi-tasking rarely works. I learned this the hard way. If there is an important task then just focus on it one at a time. Having too many hands in different tasks takes away from your concentration on each one, and the work may end up being subpar. In the end, it may mean you have to go back to fix it up. This is a very inefficient use of time. If I have competing projects at work, I generally ask the manager which is more important, or which deadline comes first. Another method that helps with being laser focused is to find your ideal time and place where you can get the most work done. Do you find that you get easily distracted in the evenings? For me, I find that I am more productive at a coffee shop even if it is noisy. The mornings are also ideal for me because this is when everything is quiet and I can concentrate to get things done. The mornings also pressures me to be efficient since I need to get ready for work. Each person is different so pay attention to your productivity to find out what works best for you. There are only 24 hours in a day. At least a quarter of it is spent sleeping. When you factor in commute time (if you have any), eating, preparing your day, this leaves very few hours for personal unwinding time. When so much of everything demands our attention, it is important to be smart and efficient in how we handle our tasks and manage our lives. Our future selves will thank you for it!